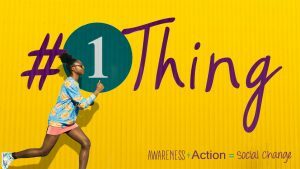 During the month of October Underground Railroad will be promoting the #1thing Campaign on social media. The national campaign, developed by the Domestic Violence Awareness Project, reinforces that change can begin with just one small action. Domestic violence CAN be prevented through the collective voice and power of individuals, families, institutions, and systems. Each “one thing” adds a valuable and powerful component to transforming our communities. Visit our Facebook page and add your #1thing in support of eliminating abuse. You may have a chance to win cool prizes just by letting your voice be heard!